At first glance, this appears to be a photograph of life in a serene Alaskan meadow. 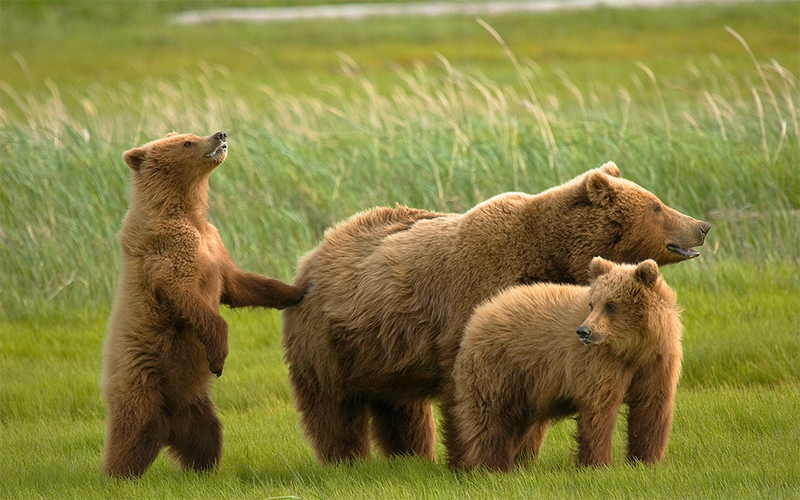 Upon closer look, these bears are in an alert posture, and there is a sense of intensity. They've just detected danger. This grizzly sow, known as "Rosie" by the Hallo Bay Wilderness guides, had just called her cubs close, preparing to fight or flee--whatever it would take to protect her twins. Rosie was popping her jaw and making low growling-type warning sounds at "Harvey," a large grizzly boar, who was entering the meadow and headed in their direction. Boars are known to kill cubs, and Rosie was taking no chances. The moment this photograph captured this scene, she immediately moved her cubs out of the meadow...and after hearing Rosie's mood, Harvey wisely did not follow.